attack, there are three parties involved: the attacker, the intermediary (the broadcast address to which the packets are sent), and the victim (the forged source IP address). In this type of attack, the intermediary can also be a victim. This is the case because when all the machines on the intermediary start replying back to the forged address, it can generate so many packets that it uses up all the bandwidth of the intermediary network.To start this attack, the attacker generates an ICMP echo request (which is the same as a ping) using a forged source address and a broadcast address as the destination. The intermediary receives the ICMP echo request, which is directed to the broadcast address of its network. This causes the packet to be sent to all machines on that network segment, with each machine replying to the request and sending an ICMP echo reply back. When all the machines on the network reply, this could potentially result in degraded service or Denialof Service for that network segment due to the high volume of traffic generated. Because the source address on the packets was forged, all the replies go back to the source address that was specified, which now becomes the victim’s machine. Because a large number of packets are being sent to the victim’s machine, this could cause network congestion or potentially make the network inaccessible. 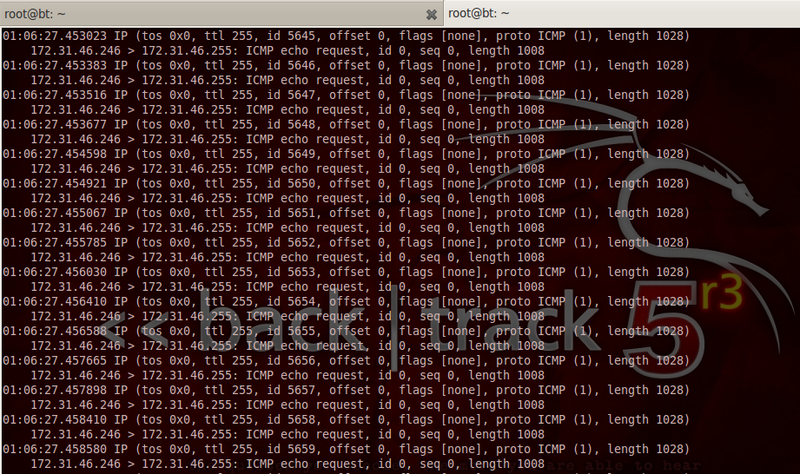 Now lets try do to the smurf attack and also analyse its tcpdump. As you can see in above screenshot that smurf is sending forged ICMP request packet to broadcast address by spoofing source IP.Now all the network PC will reply to this ICMP request and this will slow down the victim 172.31.46.246 and ultimately cause Denial of Service. 2)configure host OS such that it wont reply back to ICMP request that come from a broadcast address. I recently started working on widows 10 Apps( Apps not Applications) security. Before diving deep in hacking terms lets try to understand what's new in Windows 10 UWP( Universal Platform) as compared to old Apps. Lets begin with how apps actually work on windows 10(desktop/tablet). Now windows 10 comes with a container only for running apps inside the isolated environment. By default, /APPCONTAINER(Linker Flag) is off. This option modifies an executable to indicate whether the app must be run in the appcontainer process-isolation environment. Specify /APPCONTAINER for an app that must run in the appcontainer environment—for example, a Windows Store app. (The option is set automatically in Visual Studio when you create a Windows Store app from a template.) For a desktop app, specify /APPCONTAINER:NO or just omit the option. The /APPCONTAINER option was introduced in Windows 8.